Yeah, it is time to figure out MTN recharge card pins and then load up with it and start making calls without paying a dime (or Kobo). So here I'll show you the simple codes to achieve that. By the end of this article you should have enough MTN Airtime on your phone and do whatever you want with it: make calls with it to all networks, use it to buy data plan or even transfer it to your lovers. A Disclaimer: Hacking GSM recharge card Pins is ILLEGAL, so do it at your own risk. Simply dial *555*0000With any 8digits#, Example: *555*000012345678# then press Send. If your generated 8digits was valid, you will receive free Airtime and if not, keep trying by adding another 8digits. Keep dialing the codes with different 8 digits to get more MTN Free Airtime. Check your balance with *556#. 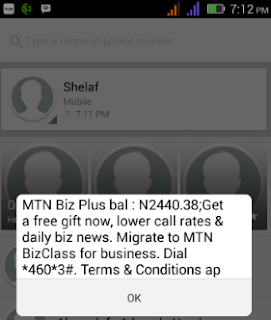 I just got over N2,000 and am trying to get more, see the screenshot below. Note that generating of the wrong codes several times may lead to barring of your account, so do it wisely. And if your account has barred, you can simply unbarred it by dial 181 or call 180. Enjoying it while it last. Not allowed here! why not consider to advertise with us... its cheap.. contact us today.